Following the release of Netscape's source code in March 1998, the Mozilla project launched its first major browser revision in June 2002 as Mozilla 1.0. 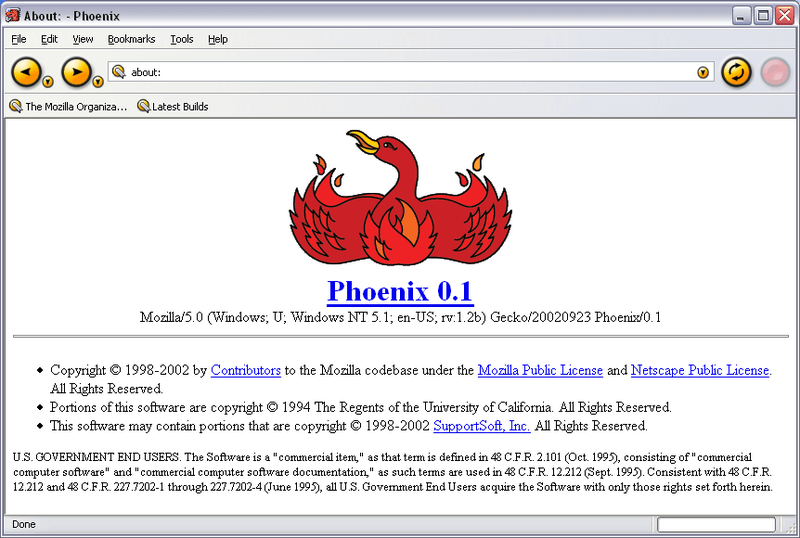 Only a few months later in September, the browser's name was changed to "Phoenix" to illustrate that Mozilla's new browser was rising out of the ashes of Netscape Navigator, though that new name was dropped in April 2003 following a trademark dispute with BIOS-maker Phoenix Technologies, which had already developed similarly named a BIOS-based browser called Phoenix FirstWare Connect. Mozilla renamed its browser from Phoenix to Firebird in April 2003, though that name was also short-lived because of a branding conflicts with the Firebird database server, which ultimately pressured Mozilla into coming up with yet another name. Firefox was chosen in February 2004 and the first version was released in November of the same year. Mozilla Thunderbird was also renamed at one point, launching as "Minotaur" around the same time as Phoenix emerged in 2002, though the original mail client proved unpopular and took on the Thunderbird moniker in July 2003 after the project was revived with a new toolkit.